The NSW Government has presented awards to the winners of its ‘apps4nsw – collaborate solutions for health’ competition, who now get the chance to showcase their ideas to government and industry. The apps4nsw program helps developers transform data held by the NSW Government and Australian Bureau of Statistics (ABS) into consumer-friendly mobility apps. A total of 35 entries were judged. Minister for Health, Jillian Skinner, and Minister for Finance and Services, Greg Pearce, recognised winners across four challenge categories. They include: Supporting clinicians, enabling system change, primary care, and empowering consumers. Supporting clinicians was taken out by My Patient List by Anthony Barker. The app allows clinicians to access mobile versions of patient lists and view real-time test results. StayWell Health Solutions claimed second for its eGuidelines app. The empowering consumerssegment was won by Breathe Right by StayWell, which provides timely information on pollen and temperature changes. StayWell also picked up second for My Hospital Food, and Tiny Beans (by Tiny Beans) came in as highly commended. Enabling system change went to Safe Medication Management and Independence for the Visually Imparied by Steve Cohen. This app uses mobile device capabilities to assist the visually-impaired in taking medication. 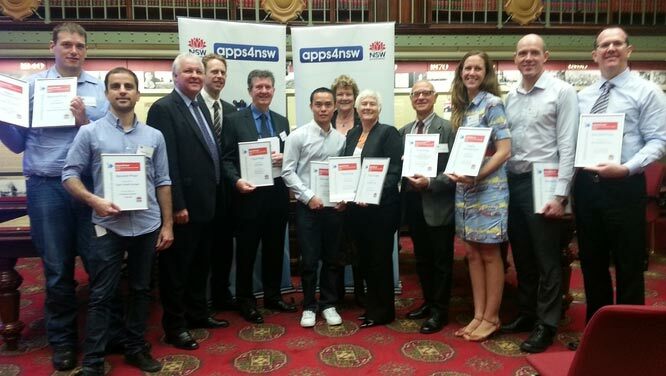 2 guys 1 app won second for Open Health Budget, and StayWell claimed highly commended for My Medical Services. The collaborating with primary care award went to The Grey Book by Staywell, an app that aids over-50s in managing and taking control of their own health outcomes. My Cycle of Care by iHealth NSW took out second. apps4nsw also featured a people’s choice category, which was presented by Samsung Electronics Australia telecommunications division enterprise business development manager, Javier Santamarta. StayWell took the top spot for Grey Book, and received a Samsung Galaxy Tab 2 10.1 as the prize. University of Sydney’s Faculty of Health Science won second for ‘Emergency Departments NSW’, receiving a Galaxy Tab 2 7.2.